Despite it being mostly cloudy it was nice to get out and capture the first known NS Heritage unit to visit the Twin Ports. We were lucky in that it was leading and that it came through here in daylight. Like most Galesburg-Grand Forks trains it took the wye at Boylston and headed west until Carlton when the DS told them to stop and run around their train and bring it back to Superior. We are guessing it was due to congestion on the Lakes Sub but I don't know for sure. My first shot was where the track curves east near Foxboro and there was actually some nice diffused sun here on the Hinckley Sub. This past weekend was the DNR's "Take a Kid Ice Fishing" event where you didn't need a license if you were helping a kid under 16 ice fish. Didn't appear the fish were biting all that well but a nice day to be on the river. The ice is thick, or at least it appeared that way with this Ford parked on it. 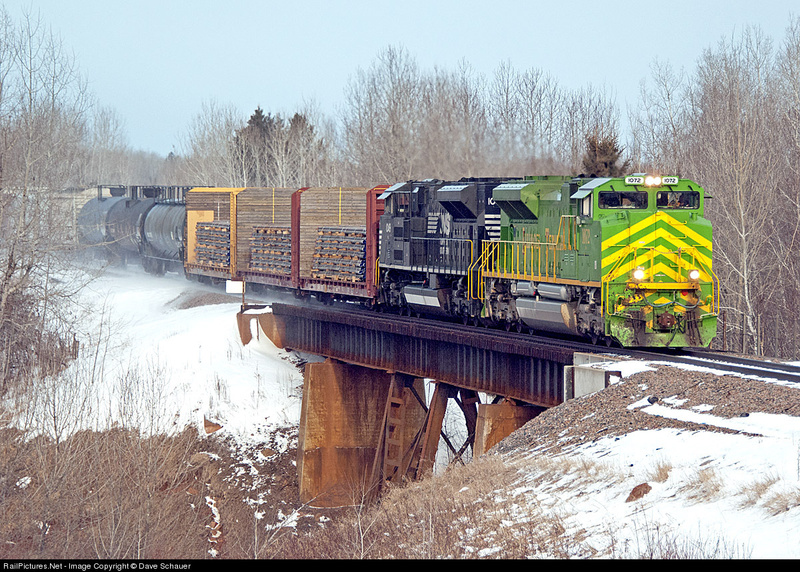 A pair of light units roll back to Pokegama Yard after assisting M-347 up Steelton Hill in far western Duluth. A beautiful winter day to spend some time ice fishing on the St. Louis River. The six-pack of Leinenkugel on the sled adds to the enjoyment. A better looking SD40-2W was seen leading loads into Proctor yesterday. Kevin and I noticed a ratty looking SD40-2W (5298) working around the dock area the past few days. 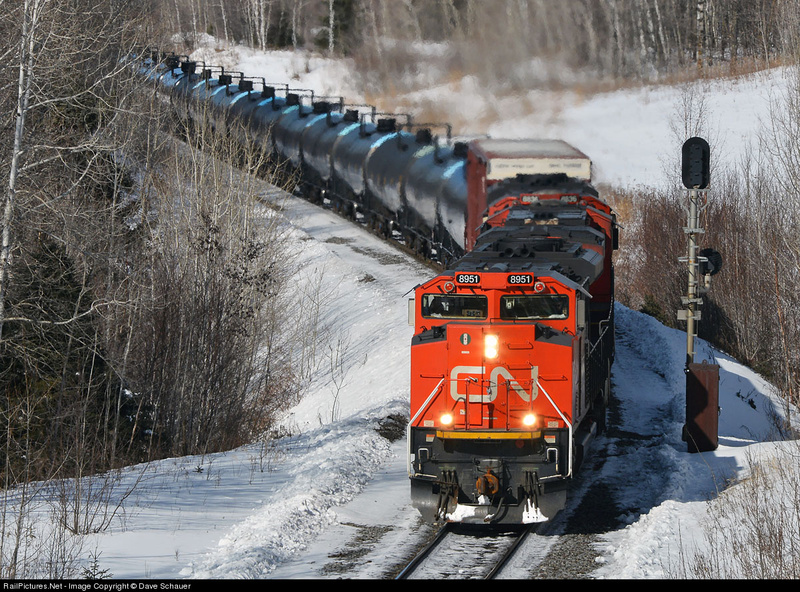 It appears CN has assigned a “dock switch” to expedite the dumping of loads and return of the PRS to Proctor along with other duties I assume. Anyone on CN know the scoop on this job? More pellets are flowing into Lakehead this winter (Unitac and Minntac) - I’m sure that is the reason Hallett is handling all of the limestone (none stockpiled at Lakehead). 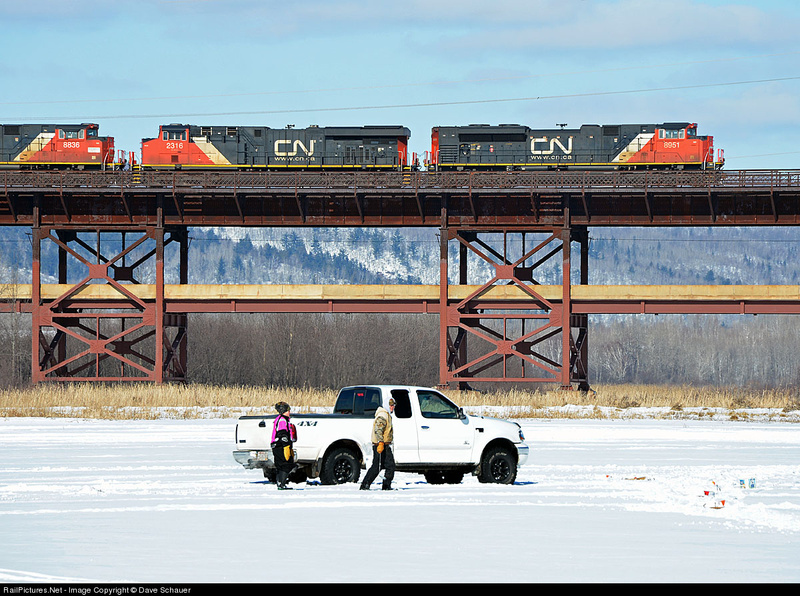 BNSF's Allouez Switch has been busy lately delivering and picking up cars from the old Koppers plant between Ambridge and Allouez. Looked to be delivering ties but couldn't tell if they were raw or partially finished. Koppers no longer treats ties here but uses the land for storing raw ties for curing before being shipped off for finishing. The pilings appear to be in with next steps being trimming them down to size and putting the caps on. 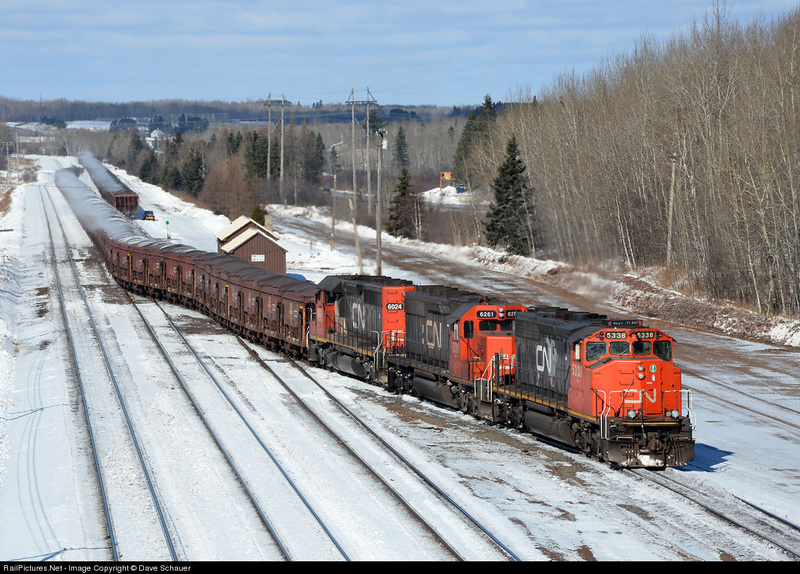 The trio was together this morning at Proctor on what looked like an empty Minntac East loader but sans crew. Saw something similar yesterday with that empty departing around Noon as a U-710. 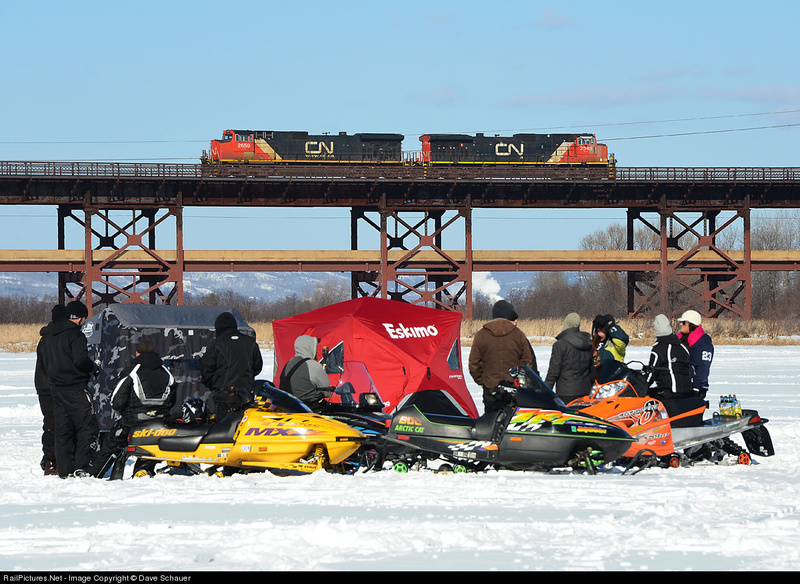 I wonder if the yard crews are putting the power on these Minntac trains to make for a faster departure and reduce the chance crews dying on hours. with three units on the point (one off-line) and 100 cars. Back when WC had solid business off the White Pine line and into Ashland it wasn't uncommon for the White Pine job to interchange at Marengo Junction with the Ashland Turn. 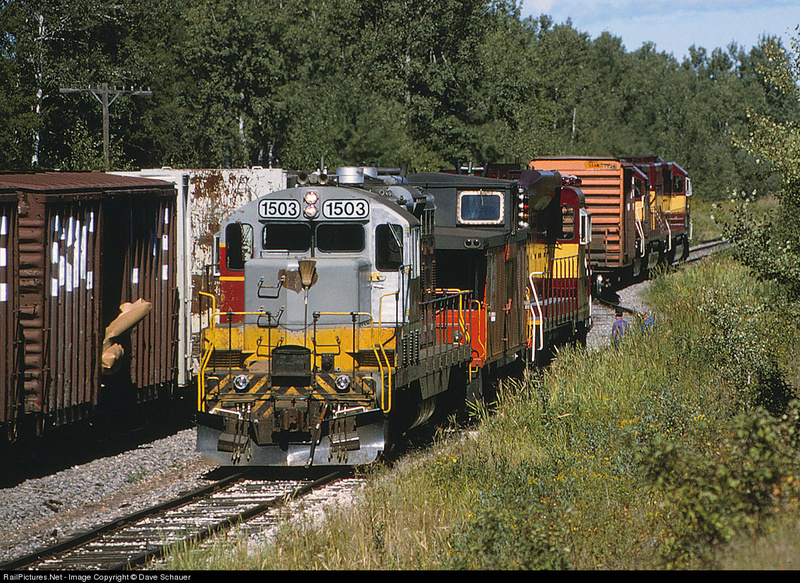 I happened to catch this hand off on a pleasant September day in 1995 back when WC used a former Algoma caboose with remote control/MU equipment on the branch. Neat GP7/GP30 combo on the remote set. 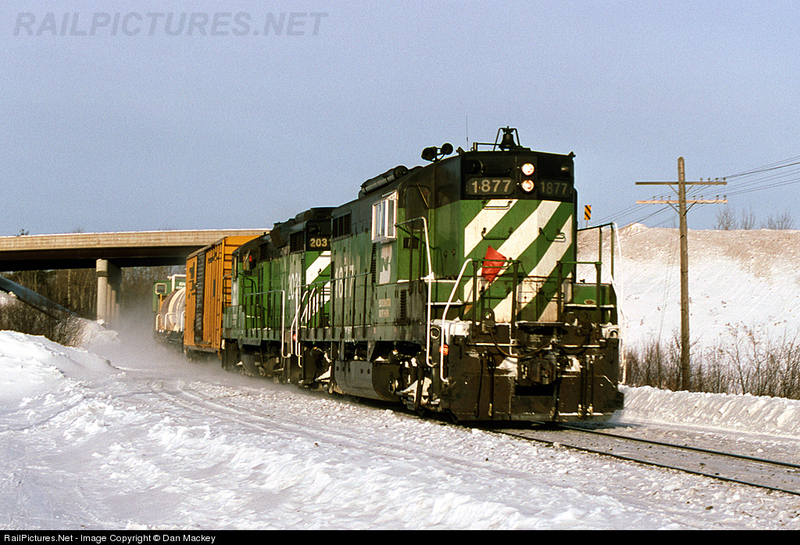 While going through some older slides I came across this one from January 1997 of the local rolling through Carlton with a few cars, I assume it's the Grand Rapids Local, but for some reason I made note of it being the Brainerd Local, so that got me wondering, did I mis-label it back then or did the Brainerd Local service Cloquet on occasion?